Roman Legion Spiked Battle Axe - Carbon Steel Axe Head, Hardwood Handle, Sharp Spike - Length 28" | BUDK.com - Knives & Swords At The Lowest Prices! 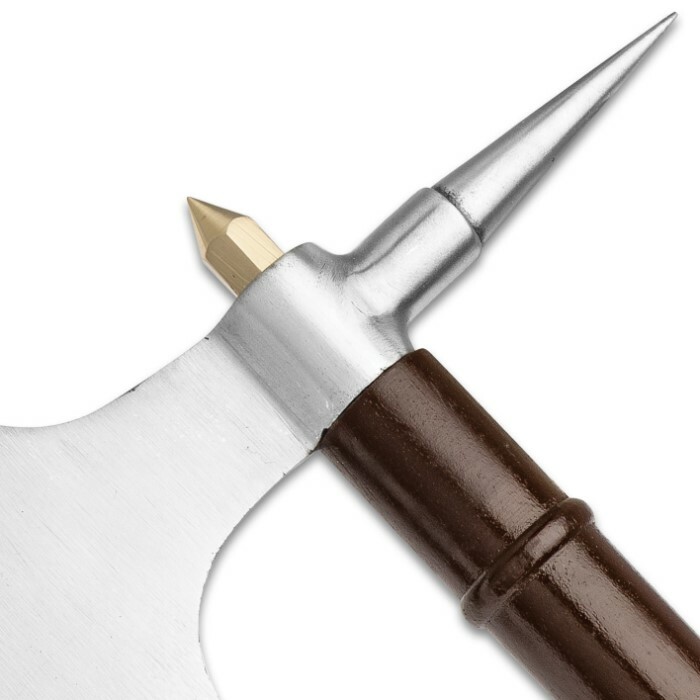 Roman Legion Spiked Battle Axe - Carbon Steel Axe Head, Hardwood Handle, Sharp Spike - Length 28"
The unique styling of the Roman Spiked Battle Axe dates back to the time when the Roman Empire was conquering the world with its fierce, highly trained legions. The axe has a 10" carbon steel, crescent-shaped head with a 6 1/4" blade and a piercing spike. Then, as an added menace, the top of the axe head features a brass skull crusher. 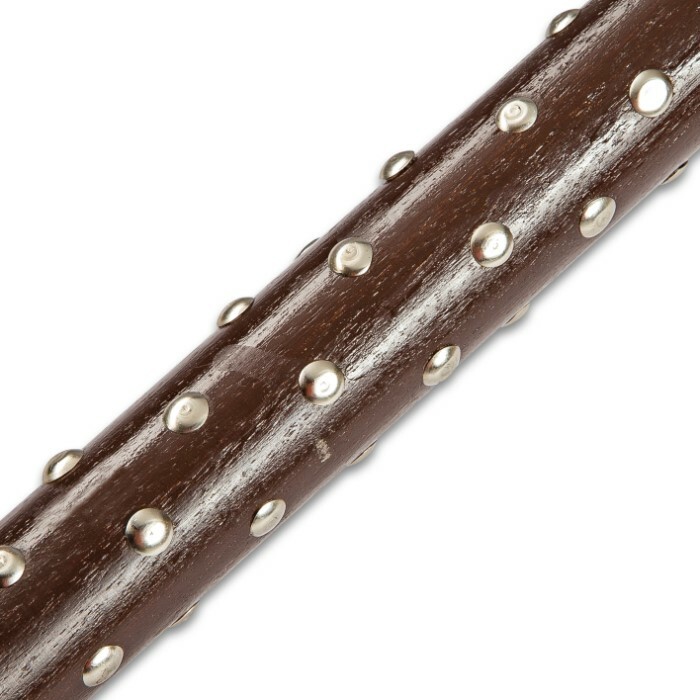 The handle shaft is made of sturdy hardwood and features steel stud accents. 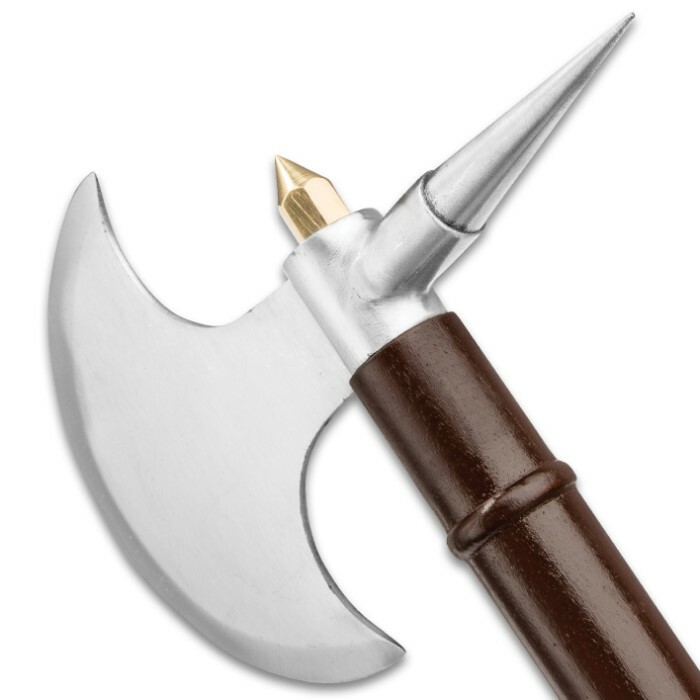 Add this battle axe to your collection today! I ordered this axe for my father-in-laws man cave. It's well built for the price. A lot of people have complimented on how well it looks. Great weapon for the price... Not sure it would survive heavy combat , but would tear a new one in a burglar. The point is deadly. I bought two and plan to redo the handle with white wax woof (almost unbreakable) on the second one. The studs were rusty straight out of the box but make it look more authentic and easier to grip. The head alone is worth the money! I bought this as one of my first items from Bud K. Very impressive and good for the price. But to make is functional as a reenactment piece you'll need to mount it to a better handle. Very good axe for price. I just got it today, and cant wait to display it. I'm not sure how much force it can with-stand, it seems very light-weight. Only problem is the rust. Its not a very big deal but on the spike on the back of the axe is rusted a little. It kind of adds texture to it so I don't mind it much. I just was not expecting to have it, but it does not diminish how great this axe looks. It's a nice looking axe for the price. Quite a bit lighter than I was imagining though. I haven't really whacked anything with it but the axe head is already wiggling a bit so I'm not sure if I will even try. The studs are pretty much just thumb tacks pushed into the wood handle. A pretty decent show axe for the price. 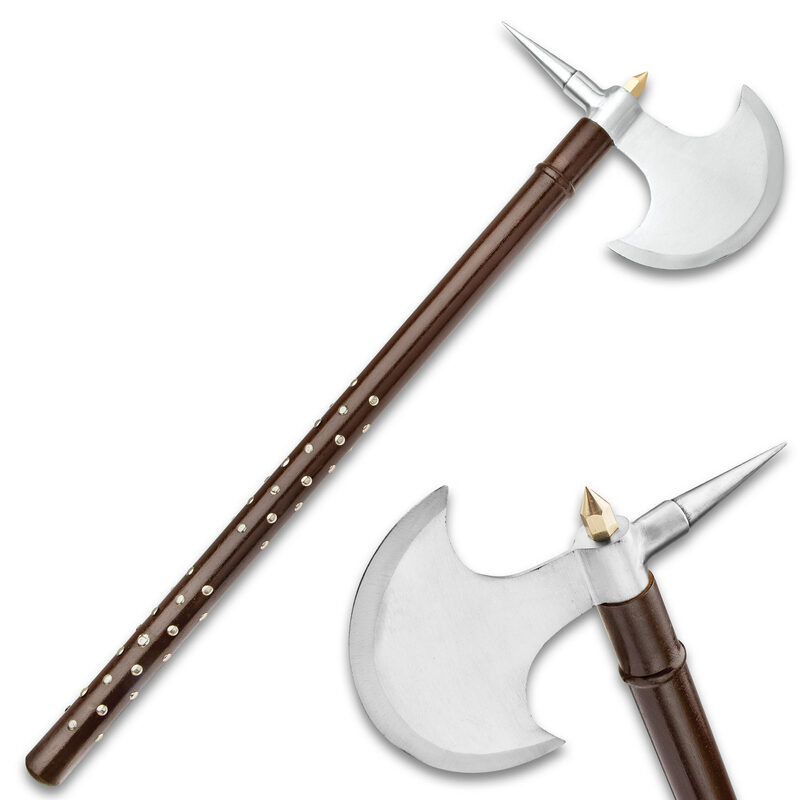 I'm still searching for a nice looking (and reasonably priced) fully functional two-handed battle axe. I bought this axe some years ago. When I got it I was highly impressed with the look of it, but I knew from the moment I picked it up that it was no combat piece. It's head loosens up way too easily for that. And the handle seems to be of a very light wieght wood. Over all it looks great when my troop does it's photo shoots and when I'm at non-combat events. I am horribly disappointed with the construction of this axe. I guess I just expected more from the picture. It would make a great ornamental piece from a distance but close up it looses alot of its luster. If it was better constructed I would have given it a five. a great axe for a great price, really sharp,well made. budk did it again.